Prior to 1986, residential development on lots of half an acre or larger accounted for 43 percent of total acres in residential use statewide. For the 1986-2007 study period, however, the share of newly developed residential land consumed by housing on large lots jumped to 67 percent. 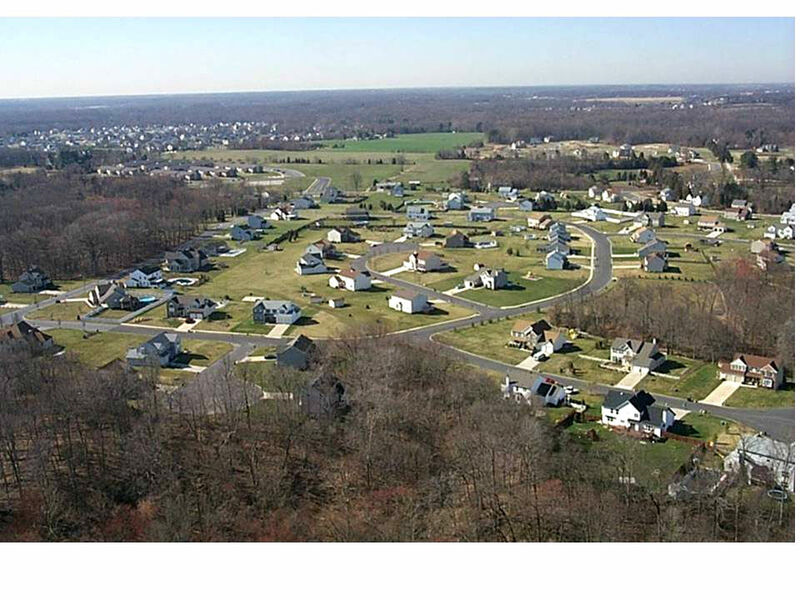 Absent further enforcement of the state Supreme Court’s Mount Laurel rulings, together with stricter adherence to land-use practices consistent with the State Plan, the study predicts that sprawl and housing segregation will worsen. 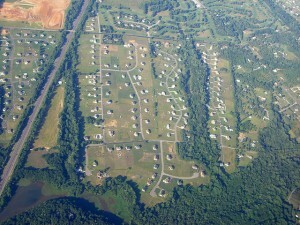 The Rowan study, titled Evidence of Persistent Exclusionary Effects of Land Use Policy within Historic and Projected Development Patterns in New Jersey [pdf], documents a trend toward more land-consumptive housing development since 1986, with fewer acres dedicated to compact residential neighborhoods with apartments, townhouses, and houses on smaller lots, and more acres occupied by large-lot subdivisions. The report found that the majority of land developed for residential uses over the study period occurred outside of the “smart growth areas” that the State Plan indicates as being most appropriate for development. What’s more, “Large-lot development is widespread even within smart growth areas,” accounting for 40 percent of the newly-developed acres there. One bright spot in the Rowan study is the finding that commercial and industrial development has much more closely followed the prescription of the State Plan, even if not explicitly by design. A much higher share (80 percent) of total acres of job-related land development between 1986 and 2007 took place in “smart growth areas” than was true of residential development (only 48 percent). Unfortunately, the resulting mismatch between centrally-located jobs and more far-flung residences means longer commutes, more traffic, more greenhouse gas emissions and less community engagement among commuting workers. In addition to examining statewide trends, the report featured case studies of Monmouth and Somerset counties, illuminating poor coordination between job and housing locations that will have negative consequences on the state’s economic recovery. 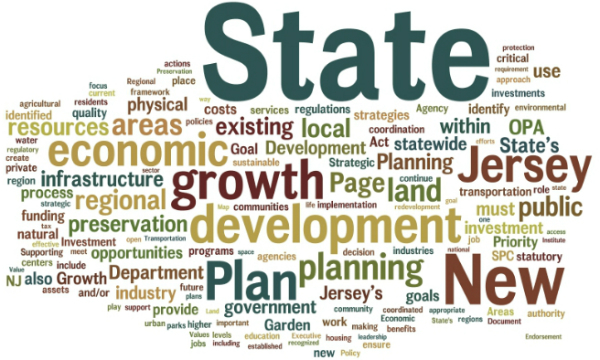 The study found that a heavy emphasis on commercial and industrial zoning, as opposed to residential, would result in a jobs-to-housing ratio of nearly 7:1 in Monmouth County and more than 16:1 in Somerset County if all undeveloped land were built out as presently zoned. The ratio generally recognized as consistent with sound planning is 1½:1 (roughly corresponding to the average number of workers per household). The report projected that if current zoning is followed, a large majority of future residential development in both counties will be large-lot subdivisions in even greater proportion than past patterns, and housing growth will lag far behind job growth. The report concluded that by consuming practically all remaining residentially zoned land statewide, large-lot subdivisions are locking in a residential land-use pattern that excludes many New Jersey households that cannot afford a large-lot single-family home. “The grossly unbalanced pattern of predominantly large-lot residential development and comparatively little compact development being imposed on the New Jersey landscape has implications for future affordability of housing, as well as for the sustainability of the state as a whole,” the report warned. The Rowan study was conducted under a research contract with the Fair Share Housing Center and funded by a grant from the Fund for New Jersey. South Jersey, which has most of the remaining open space in the State, stands to lose the most if the trend continues. Local Planning and Zoning boards have been generally ineffective in preventing sprawl and saving our natural resources. Home Rule has been no rule in this case. Time for a change. As a 3yr resident of NJ in Readington Twp I’ve learned that one method our twp uses to ‘maintain our rural character’ is to require large lot residential development. This would seem to contribute to the results found in the Rowan Univ. study. And this doesn’t sound reasonable to me. It’s still development. What would be a good alternative for the agricultural communities like mine who want to keep the rural character. I would think more planning around town centers. Our’s, Whitehouse Station is struggling. Thanks. As usual your posts are really interesting and informative. You raise an important question about how large residential lots should be in order to preserve “rural” character. The answer is that there is no definitive answer — any imposed minimum is necessarily going to be arbitrary, although I guess some are less arbitrary than others. Two- or three-acre lots really seem to accomplish open space fragmentation more than open space preservation. In the Pinelands agricultural areas, the minimum lot size is 40 acres (that’s 40 with a zero) — that ought to do it, right? But how about somewhere in the middle? Would 20 acres be OK? Ten? As another point of reference, back in the late 1990s New Jersey Future participated as an amicus in a lawsuit in East Amwell Township, not far from you. We wrote our brief supporting the township, which had down-zoned (i.e., increased minimum lot sizes) to 10 acres, but with the additional requirement that the homes on those 10-acre lots be clustered. So our feeling was that 10-acre zoning by itself may not have been enough, but that the additional clustering requirement (grouping the homes near each other at the corners of their respective lots) would produce the result East Amwell was going for — large stretches of contiguous open space. There is only one good policy answer to curtail sprawling development and stimulate the creation of high-density but very livable communities. The traditional form of property taxation, which penalizes property improvements and rewards the holding of land off the market for speculative gain is a primary cause of srawl. The solution would be to exempt improvements (i.e., buildings of all types) from the tax base. Then, an annual tax on land should be levied that comes as close as possible to the potential annual rental value of the land parcel owned. What this does is removes the ability of actual or imputed rental income from land ownership to be capitalized. Land prices will come down even as communities have more revenue to pay for desired (and needed) public goods and services. As empty or underutilized land in cities and towns is developed the pressure on rural areas is lessened. One of the principal drivers of sprawl and its associated lack of housing opportunity, habitat fragmentation and excess fuel usage is the DEP rules concerning wastewater. We’ve seen the pattern of sprawl intensified in the northwest by virtue of DEP’s refusal to provide wastewater support for smart growth areas (centers) while issuing permits for sprawling development outside centers. With that, we have a continued exacerbation of the above noted trends. At the same time, existing centers, in need of support for redevelopment, get short shrift. The bright side of the economic downturn (especially in housing) is that builders will be more inclined to build apartments in developed areas, less inclined to build sprawling single family home developments – because it’s harder to get a mortgage, and there is an oversupply of existing single family homes. In Franklin Township (Somerset County) most of our constructed or approved new housing has been apartments or townhouses, and the relatively few single family home developments are on small lots (1/2 acre or less); one is part of a development that is mostly apartments and townhouses. Also, we have been able to preserve a lot of farmland and open space. Communities with a lot of developable land left should emphasize clustering. Houses on two acre lots won’t leave much useful (for wildlife) open space, but if you can cluster twenty homes on half acre lots and leave the other 30 acres undeveloped you are doing some good. Builders prefer it, they have less infrastructure to install. Homeowners have less land to maintain and can use the open space as such. A further detail of this should be to exclude wetlands and any other undevelopable land from the “yield map” that the developer submits to establish how many houses he could build on the property. The only caveats are 1) without sewers, you have to establish how to handle waste water; 2) you may need to establish a deer control program on those 30 acres.